A speakeasy within a bar? 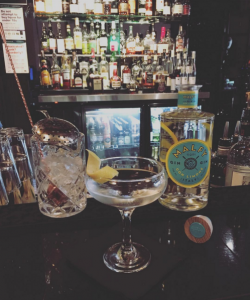 This has to be one of Melbourne’s best kept secrets and we can’t really tell you much about it except that if you like top end spirits and guaranteed privacy, then you should probably check it out. A little bit eclectic, a little bit Gansta, a little bit posh and a little bit grungy? Think F. Scott Fitzgerald meets Dead Rabbit New York. St LuJa doesn’t really fit into any specific mould as such but is happy to break them all! It is definitely interesting and wholeheartedly quirky and we wouldn’t have it any other way! With the announcement of Fitzroy St coming back to life in 2017, it was only a matter of time before something new was to be announced! St. LuJa, a smoke fusion restaurant with a beverage list that specialises in classic & twisted cocktails, and serious whisk(e)y choices. 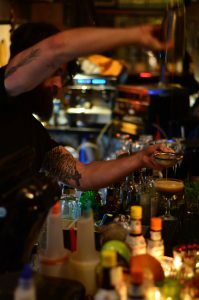 Up until now, there has been no ‘signature’ cocktail/whisk(e)y bars in St Kilda, whose kitchen also stays open late. St. LuJa has hospitality veterans behind the charge, Luke Jovanovski & James Murphy who have worked in hospitality in Melbourne for a number of years, managing & directing bars & venues for big companies such as Publican Group Australia & Red Rock Leisure. Along with Luke & James, the owners of The Croft Institute have signed up as the ‘silent’ third partners, which means you can trust everything being produced in this venue will be of quality and have a world of knowledge behind it. The kitchen is run by Head Chef, Allison Hartmire previously of State Of Grace & Mr Mason. One of Allison’s many talents is designing degustation menus to surprise & awe guests but also to have them feel at ease with the dishes presented to them. To match cocktails with these monthly degustations, they have brought on Jesse Cummins, head bartender & cocktail enthusiast previously of Fall From Grace, with experience in curating cocktail matching menus along with Allison’s dishes for the first 4-part series of degustations. St. LuJa’s degustations will be held every first Wednesday of every month. They will be 4-part different themed degustation dinners, beginning with the Gangster Themed degustation on May 3rd. Each seating will be 4 courses plus matching beverages at $125 per person. If you’re keen to join in on the degustation fun, spots are extremely limited, so be quick! The first degustation sold out within 24 hours of being announced! To enquire and book in for the future degustations, email info@stluja.com.au – please note full pre-payment is required in order to secure your place. Check out their website here.